2 Pair 1/32 Scale Handmade Urethane Slot Car Tires...... 2 pair PGT-22147XXD fit all Carrera F1 2010-2015 Liveries. Custom designed for Carrera cars only... Cars and accessories not for sale, tires only . 1/32 Handmade Urethane Slot Car Tires. 2 pair PGT-20125LM new larger inner bore (13mm). custom tire for all Slot.it 17x10 wheels. "xpg" extreme soft (a20) slot racing tires. New ListingVINTAGE 4 PIECE STROMBECKER ECHELLE MOTOR GROUPING / 1/32 / #109105 / NEW OLD!!! Card is marked Canada / #109105. All 4 motors for one money. Always happy to combine S&H when possible. 2 Pair 1/32 Scale Handmade Urethane Slot Car Tires...... 2 pair PGT-20138LM fits Fly Dodge Vipers with wheels with 8mm ridges) fit nearly all FLY with 8mm ridge on wheel, Panoz, etc etc etc. Slot It McLaren F1 GTR Leman 1998, Loctite number 41. T. Bscher, R. Capello and E. Perro. 2 pair PGT-19124LM (19x12x4mm) fit Scalextric Aston Martin DBR9 also fits Stevenson Camaro, Ford GT, Audi R8, Peugeot 908... XPG EXTREME SOFT TIRE FOR SMOOTH WOOD and PLASTIC TRACKS. Model number C2922A. Digital Ready cars. Drivers Mark Waco and Nels Miller. Model number C3729. SB-30 Scoring Pylon & Leaderboard. SLOTCAR SCENERY BUILDING. Used Vintage Revell 1/24, 1/32 Scale Slot Car Aluminum Adjustable Chassis. Used Vintage Revell 1/24, 1/32 Scale Slot Car Aluminum Adjustable Chassis.. Condition is Used. Shipped with USPS First Class Package.one pickup wire is off. Chassis is clean and runs. Pics are the best description. We offer buyer satisfaction. If you receive an Item and you are not happy with it or think it was misrepresented please message us before leaving feedback and we will work to make it right. If payment is not received in 48 hours of the auction end and unpaid case will be opened with eBay. Check out my other listings for vintage toys and other cool items. Thanks for looking and happy bidding. 2 Pair 1/32 Scale Handmade Urethane Slot Car Tires...... 2 pair XPG-20137LM... fits Carrera La Ferrari. SOFT TIRE FOR CARRERA, SCALEXTRIC, and ALL WOOD TRACK SYSTEMS. Up for sale is this Hawk 1/32 4-29 Maserati 5000 GT top slot car model with decals, instructions and original box. The model was painted and the clear plastic front and rear windows have been affixed. Shelf wear on the box. plastic box has a corner chip, see pic. Porsche 936 Martini. 936 Martini #6 2 Bodies. 1:32 Spirit Bodies. 1:32 NEW MINT SLOT CAR IN BOX. SLOT.IT SICA05E NISSAN R390 GT1. ESTORIL TEST 1997. NEVER OUT OF THE CASE (SHRINK WRAPPED) IN MINT CONDITION CAR, CASE AND SLEEVE. PICS ARE OF MY OWN COLLECTION. expect prices to double. get them while you can..
Porsche 924 GTR Brumos. #87 Le Mans 1982. 1/32 Falcon Slot Cars. SLOT.IT SICA18A FORD GT40 #24. NEVER OUT OF THE CASE (SHRINK WRAPPED) IN MINT CONDITION CAR, CASE AND SLEEVE. PICS ARE OF MY OWN COLLECTION. expect prices to double. 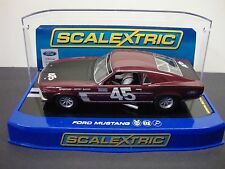 get them while you can..
SCALEXTRIC C3002 FORD MUSTANG. ALLAN MOFFAT #33. NEVER OUT OF THE CASE IN MINT CONDITION CAR & CASE. NEW RARE MINT 1:32 SLOT CAR. make Supersized seem small. New ListingNICE 1/32 SCALE CARRERA EVOLUTION 1970 HEMI CUDA SLOT CAR W/ CASE TESTED RUNS!!! THIS IS IN OVERALL EXCELLENT USED CONDITION. SHOWS TYPICAL USAGE WEAR. CASE HAS A CRACK. THIS WAS BENCH TESTED USING A 9VOLT BATTERY AND DOES RUN. New ListingNICE VINTAGE 1/32 SCALE ELDON CORVETTE STINGRAY SLOT CAR TESTED RUNS!!! THIS IS IN OVERALL EXCELLENT USED CONDITION. SHOWS TYPICAL USAGE WEAR. THIS WAS BENCH TESTED USING A 9VOLT BATTERY AND DOES RUN. Slot cars are both classic collectibles and fun toys to play with. 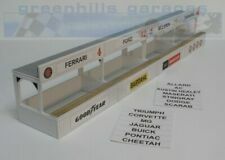 Whatever the model or style, buying cars and tracks, assembling the set, and racing them is a fun activity. Some of them are display pieces, while others are meant to be raced. What kind of slot cars are available? The biggest divide in slot cars is between the early pre-1970 models and the post-1970 models. Before 1970, slot cars were primarily toys for children. Eventually, manufacturers caught on to the growing usage among hobbyists and began marketing them to adults as well. Some models are based on real cars, some are based on fictional models, and others are original designs by the creators of the set. Most are sold alone, but a few come with an entire themed kit. 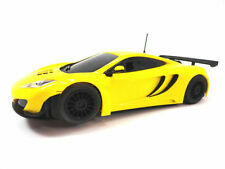 It is also possible to find a basic car and then add decals and paint, redesigning it to your specifications. Rare editions can be highly collectible because production has ended. Some hobbyists seek out specific models because they want to have a collection built of slot cars that are rare in addition to having other characteristics that fit their tastes. For any kind of toy or model, the scale indicates the ratio of size between the original and the model. For example, 1/32 means that the original is 32 times bigger than the toy. That illustrates why all slot cars are about the same size; they are based on the same ratio. Not all toy cars are 1/32 scale. A smaller scale like 1/48 would be tiny, while a larger scale like 1/16 would indicate a model that is much larger. Moreover, the larger the scale is, the bigger the difference will be between cars of different sizes, such as sports cars and vans. How do you build a 1/32 slot car track? There are a few different types of slot car tracks. The simplest is a plastic kit that can simply be fitted together. You can purchase all the track elements to make a complete circuit. You can mix and match pieces from the same manufacturer to make new, original circuits as well. With more experience, it is possible to build tracks out of wood. This requires care, because the slots and the circuitry have to be precisely arranged for the cars to proceed. However, it allows for greater creativity and customization.